Edmond Regional Eye Associates offers a complete selection of contact lens fitting options. There have been continual technological advances in the field of contact lenses. 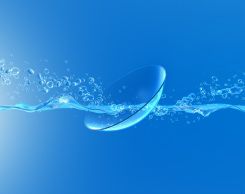 Modern contact lenses offer greater comfort, safety, and better vision than ever before. You can trust our physicians at Edmond Regional Eye Associates to keep abreast of new developments related to contact lenses and to give you the very best care possible. Contact lenses are available in a variety of hard and soft materials. Contacts also come in many sizes and colors and are used for convenience, bifocal needs, cosmetic appeal, sports applications, and in the treatment of certain ocular disease conditions. Never worn contacts before? Here is what to expect! For new contact lens patients in our practice, the journey starts with a detailed discussion with your doctor to determine the best options available to meet your specific needs. The doctor will perform a refraction to determine the power of your prescription and a picture will be taken to measure the unique shape of your eyes. After your specific contact lens needs are determined and your eyes examined, the proper lenses will be chosen. Although we have a large selection of the more popular lenses, your precise contact lenses may need to be ordered. We can then schedule a time for you to return so the physician can check your eyes and vision while wearing your new lenses and teach you the proper methods for placing and removing them. We also ensure you appreciate how to clean and care for your new lenses, and understand when they are to be replaced. Most patients pick up these new skills quickly while others need more practice before mastering. We try to schedule enough time for you during the fitting so that you are comfortable and competent with your new contacts. Call today to schedule your contact lens fit!